VMO On-the-go is Australia’s leading petrol and convenience digital network reaching over 15 million customers monthly. 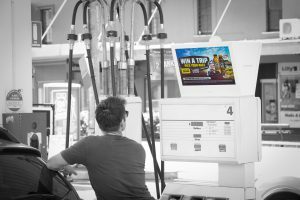 Focused on delivering a network that transforms the forecourt and enhances customer experience, VMO recently conducted an in-depth study to gain consumer perspective of its network, the role it plays on the forecourt and on the path-to-purchase. 8 out of 10 find the content informative and innovative. Further findings revealed that C-store offers and promotions are what customers would most like to see on the VMO network, ranking this the #1 for relevancy. A testament to the theory of ‘right place, right message, right time’ having the ability to influence consumer behaviour, VMO seems to have the right formula in place. Analysing transactional data for 3 leading FMCG products advertised on the VMO network and available in the C-store, research identified a 5X increase in C-store sales. As the P&C proposition has continued to evolve, offering customers much more than fuel and daily essentials, 1 in 3 people said they usually buy fuel along with a product they didn’t plan to purchase – a good opportunity for brands to drive impulse purchases via the VMO network. With all of this insight on hand, VMO continues to innovate and enhance their network in order to deliver the best solution for P&C owner-operators and customers alike. Come and see VMO at the C&I Expo next week and experience the forecourt of tomorrow. VMO will have a live showcase of their digital screen network so you can see it in action and will be revealing voice and touch activated innovation coming soon.